This award-winning film production company uses iBase video library software to manage over 200,000 items of high quality video footage. Offices in USA, New Zealand, Singapore, Australia and South Africa can now share video content for collaboration and also offer online previews of the originals for sale. NHNZ is an award-winning New Zealand-based factual television production house creating original content for global broadcasters. NHNZ contacted iBase when they were looking for a supplier to help them with the development of their NHNZ Moving Images website. 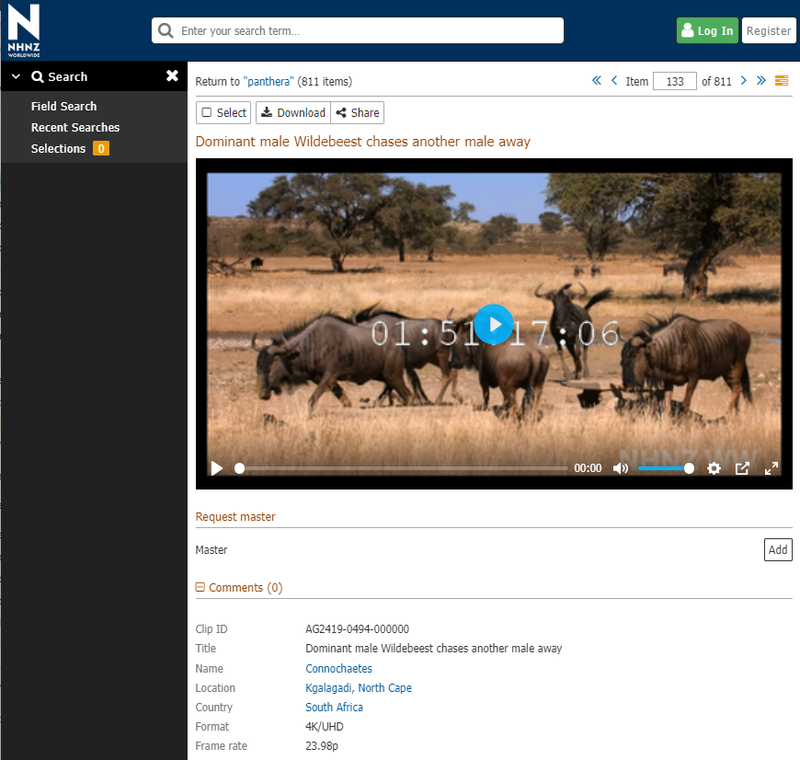 iBase provided NHNZ with a comprehensive video cataloguing tool and customised browser-based front-end, with the ability to add clips & metadata and publish them, with video thumbnails, to the public interface where users can search using a variety of methods, preview the clips and request licences for full-length, hi-res versions. Custom video workflows to enable shot logging from showreels and key frame selection. Video watermarking and video preview thumbnails. Searching options include subjects, advanced and refine search. Google style searching with auto spell check and search suggestions to ensure visitors always return results from any search for maximum engagement. User registration to access enhanced features. Download clips to preview before purchase. Visitors can email links to videos to colleagues. Favourite videos can be saved into Clip Bins for later viewing. The whole project was delivered on-time and to-budget, and has been lauded throughout the footage library industry, with numerous accolades and award nominations. After an 18 month worldwide search to find a suitable Digital Asset Management solution that would enable NHNZ MOVING IMAGES to take our vast archive of stock footage online we found iBase. Taking their standard platform we worked closely with their development team to tailor the system to our very specific needs. This included migrating over 200,000 text records from a legacy system to iBase, and taking the records online and linking them with newly made video clips. The iBase team is professional, expert and diligent, and comes highly recommended.